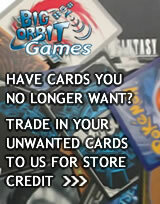 Pokemon Power: Prehistoric Power: No more Evolution cards can be played. 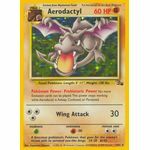 This power stops working while Aerodactyl is Asleep, Confused, or Paralyzed. [C][C][C] Wing Attack: 30 damage. [W][W][W] Freeze Dry: 30 damage. Flip a coin. If heads, the Defending Pokemon is now Paralyzed. 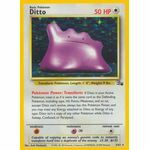 Pokemon Power: Transform: If Ditto is your Active Pokemon, treat it as if it were the same card as the Defending Pokemon, including type, Hit Points, Weakness, and so on, except Ditto can't evolve, always has this Pokemon Power, and you may treat any Energy attached to Ditto as Energy of any type. Ditto isn't a copy of any other Pokemon while Ditto is Asleep, Confused, or Paralyzed. 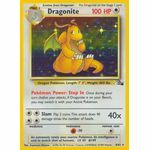 Pokemon Power: Step In: Once during your turn (before your attack), if Dragonite is on your Bench, you may switch it with your Active Pokemon. 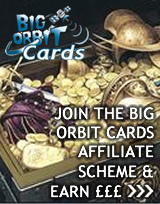 [C][C][C][C] Slam: 40x damage. Flip 2 coins. This attack does 40 damage times the number of heads. 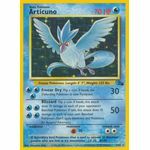 Pokemon Power: Curse: Once during your turn (before your attack), you may move 1 damage counter from 1 of your opponent's Pokemon to another (even if it would Knock Out the other Pokemon). 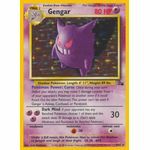 This power can't be used if Gengar is Asleep, Confused, or Paralyzed. 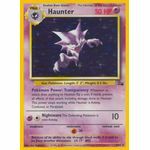 Pokemon Power: Transparency: Whenever an attack does anything to Haunter, flip a coin. If heads, prevent all effects of that attack, including damage, done to Haunter. This power stops working while Haunter is Asleep, Confused, or Paralyzed. [P][C] Nightmare: 10 damage. The Defending Pokemon is now Asleep.